What is an urban jungle? Well...it is the city. It refers to the streets, alleys, and subway systems, as well as the inner-city neighborhoods, playground, and schools. It can also be seen as a decaying industrial section of town. However, we want to redefine an urban jungle. Yes, we live in a city, and maybe even in one of the harder areas of our town...but that does not define our school. Our kiddos here are over 80% free and reduced, but that does not label us. Our farm to school grant proved that even if our families struggle a bit, we as a school community want to teach our students how to learn healthy eating habits, how to create a school garden, and learn the value of being outside, actively learning in our outdoor classroom. People ask me, what next for your school garden. First it is our school garden. One where we are always learning something we can take with us outside of our garden. From GMO's to plants going to seed. Perennials vs. Annuals or even growing seasons and what vegetable look like (I had volunteer teens in the garden this week that didn't know what vegetables we were even picking, yikes!) The garden is a tool to teach kids life skills! 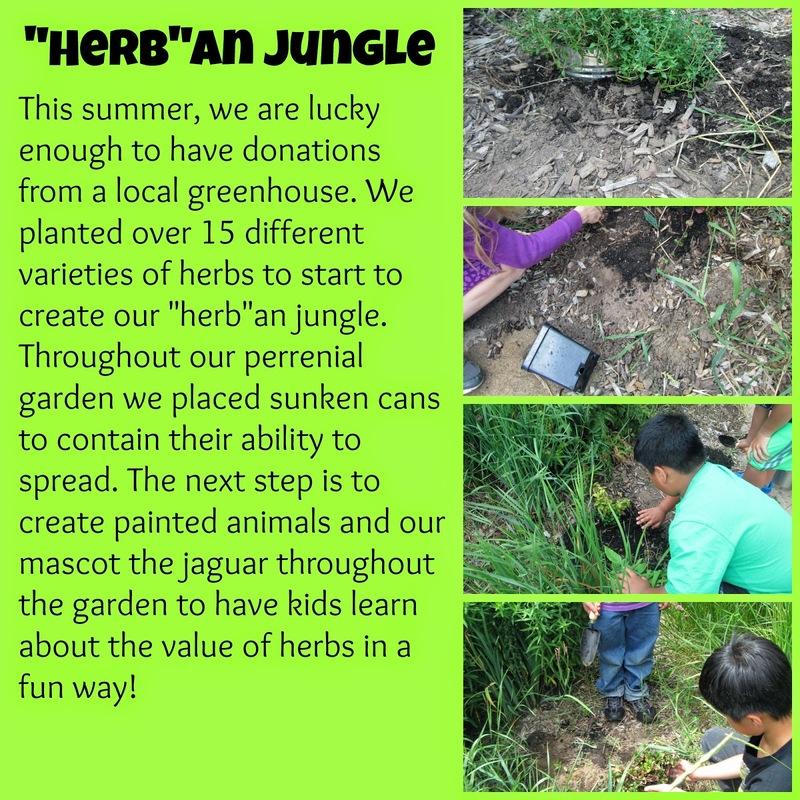 Our next goal, to make sure we create a fun learning atmosphere in our garden...in comes the "herb"an jungle. We planted herbs throughout our perennials that we will use to cook with, understand their value, and add to the bounty of our garden. We are hoping to connect the high school art department and shop to make large scale animals that we can place within the garden. Then hosting an art show to get more community members to see what we are doing. Check out our herbs...chocolate mint, orange mint, sage, thyme, chevil, rosemary and more! Next week, we will be making sun tea with our herbs! Stay tuned for what we will make to eat on Tuesday! Hi Renee, I love your garden. My school has a garden as well, and my kiddos love it. I wrote the grant to get the garden and this past year turned over the management of it to another teacher. I was finishing my grad work, and to be honest was becoming frustrated with people coming up after hours and stealing, pulling up all of our hard work. Keep up the good work!